On the first day of the 2015 ABN AMRO World Tennis Tournament in Rotterdam, Grigor Dimitrov saved two match points to defeat Paul-Henri Mathieu, 4-6 7-6(2) 6-2 to set up a second round tie with Gilles Muller. Dimitrov looked to be heading out of the tournament after a sloppy start to his first rounder. Mathieu dominated the match for a set and half, going up 6-4 5-3*. Mathieu was the more consistent player with his backhand down-the-line the star of the show. Dimitrov saved two match points though with gutsy winners. Mathieu’s failure to serve out the match was more about Dimitrov playing well rather than Mathieu playing badly. At the start of the second set tiebreak, Mathieu was angered by a call, which saw a point have to be replayed. He never recovered mentally as Dimitrov gained control of the match, which rolled to an inevitable conclusion. The pair argued again at the end of the match. At the end of the day, one point doesn’t change a match and Mathieu’s inability to maintain his composure was the clincher. In the second of the night matches on Monday, Gilles Muller beat David Goffin, 7-6(5) 6-7(6) 6-3 in two hours and 13 minutes. I watched the first set which was pretty even. Goffin started the better, but Muller grew stronger throughout the set and had a set point at 6-5* which he should have taken, only for Goffin to just catch the line with a pass. Muller served up 15 aces in the first set and finished the set with a lefty serve out wide, which frequently caused Goffin problems. The match went the distance and it was a lone break of serve from Muller in the decider that clinched it. Muller was playing some great tennis, but it was a disappointing loss for Goffin who has gone 4-4 (W-L record) at the start of this year. Match poll results: 35% of readers correctly predicted that Thiem would beat Gulbis in Rotterdam. Tournament poll results: 36% of readers have gone for Murray to win Rotterdam with 20% going for Raonic and 15% for Berdych. 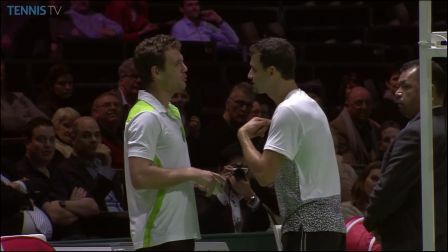 February 10, 2015 in ATP, Dimitrov, Muller, Rotterdam. Everyone knows that Grigor is a desperado now. He wants victory to death. I don’t him winning Grand Slam soon not until the big 4 retire. Early exit for Dimitrov and he is no baby Fed. Fed already had a grand slam at his age. Gasquet plays more like Fed than Dimipova.